Easy to clean and exceptionally durable, this better grade of Golden Taklon is an excellent choice for oils and acrylics, because it stands up to oil painting solvents and acrylic paints very well. Bright, Set of 6, Long Handle — Save with a set that offers a range of sizes, including sizes 0, 1, 2, 4, 6, and 8. Flat, Set of 6, Long Handle — Save with a set that offers a range of sizes, including sizes 0, 1, 2, 4, 6, and 8. Fan, Set of 3, Long Handle — Save with this set that offers one of each size Golden Taklon Fan, including sizes 2, 4, and 6. Assorted, Set of 5, Short Handle — This set includes one each 1/2" Flat, 1/2" One-Stroke, Size 2 Script, Size 1 Round, and Size 2 Fan. 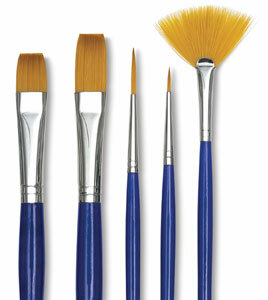 One-Stroke, Set of 4, Short Handle — This set includes sizes ¼", ½", ¾", and 1". Script, Set of 4, Short Handle — This set includes sizes 0, 1, 2, and 4.